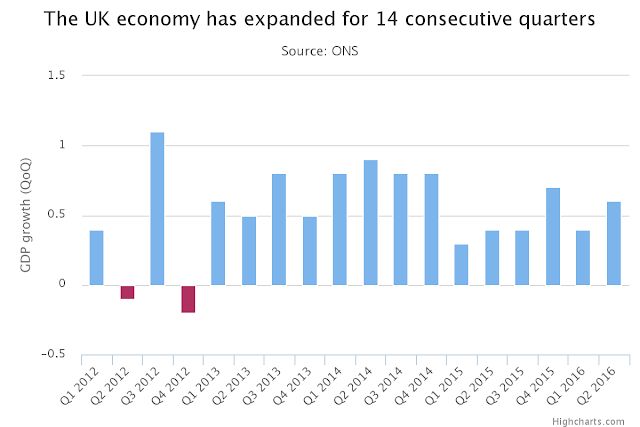 To the disappointment of Remain campaigners, the UK economy grew by 0.6% in the last quarter. The Office for National Statistics made the surprise announcement today, driving the FTSE 250 past the level it was prior to the EU referendum last month and pushing the FTSE 100 up to a 12 month high. Despite the scaremongering during the referendum campaign and the continued scaremongering that is still happening more than a month later, the UK economy has continued to grow. The predicted temporary dip in the stock market turned out not to be the global economic apocalypse predicted by George Osborne and the economic "experts" drafted in by Project Fear after all and was just, as expected, a temporary blip. A new £35m trade agreement has been signed with the US which will see imports of British beef and lamb resumed and at least 10 countries - including China, India and Japan - have committed to negotiating new trade deals with the UK. One of Project Fear's corporate propagandists, GlaxoSmithKline, has announced a £275m investment in the UK today despite threatening to pull out of the country if we voted to leave the EU. Research by Pitchbook for London & Partners has found that $200m of venture capital has been pumped into UK startups since the EU referendum and Chinese property developers are ramping up investment in the UK thanks to the weaker pound. Siemens warned before the referendum that it would cancel a £310m wind turbine operation that would employ 1,000 people if we voted to leave but has decided that it wants the billions of pounds of business it will generate after all and the world's largest telecoms equipment manufacturer, Huawei, is investing £1.32bn in the UK. McDonalds also announced further investment in the UK today with 5,000 new jobs to be created by the end of next year. It's funny that the more positive news there is about the economy, the quieter the Remainiacs get.